Faithful readers (and to be quite honest everybody else as well) might remember how buying a tan PukiFee Vanilla was at the top of my to-do list for 2015? Yeah, forget about that. Oops. Since Fairyland is not currently open for purchase of tan PukiFees, I was resigned to wait it out until the next event happened. But stupid people do stupid things, and I looked at Luts’s website. And saw Tiny Delf Hansel again, whom I’d liked for another character of mine. A character who quite adamantly told me that she was to be shelled in a 1/6 doll instead – she is the one who will be shelled in the LittleFee Halloween event faceplate. But Hansel is adorable with her cute little smile, I’d really liked her already back then, and I soon started blabbering about whether I should go with her instead for Phia. I annoyed my friends, everybody in the Tiny Delf thread on DoA, random people on Tumblr, and even my cat (sorry everyone). I googled and googled until there was nothing left to google about Tiny Delfs. And then I struggled for some time, going back and forth, until I wasn’t even able to answer what doll I’d choose if I could have either of them right now. Tonight I finally caved and pushed the buy button – obviously with careful enabling from a certain someone, whose famous words were probably the last straw: You can always sell her if it doesn’t pan out. Well, truth is I probably won’t be able to because of the almost hilariously awful BJD second hand market, but fingers crossed I won’t have to. Fingers crossed that once she’s in my hands I can’t even remember that PukiFees have better posing or that I had carefully laid out plans which happened to go kaboom. Fingers crossed that I don’t regret this. Congratulations on the new one 😀 I have a tiny delf Peter myself (centaur version) and let me tell you, the tinies are adorable v< I hope she fits as your character! OMG that face is so cute!!!!! I’m dying X)!!! Congrats!! Phia will look amazing! Hope she works out :D! Oh, you do? :O I have to see them. n_n There’s too few Hansels around for me to drool over! Oh congrats!! She looks so adorable. Hopefully the wait won’t be too long for you. Luts seem to get their dolls out in a reasonable timeframe from what I’ve seen. I have heard their bodies are pretty good at posing and I know their resin is quite lovely. 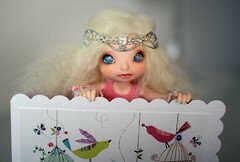 My Luts Maska is one of my more photogenic dolls. Oh gosh, I agree. The secondhand market is just so horrible right now. I’m trying to sell a body and a doll on there and I’ve had zero queries on it. I don’t know what’s going on. Really? Very happy to hear that. n_n Must admit that I love when dolls are really photogenic. I don’t know what’s going on either, it’s really awful. I suspect it has a lot to do with recasts and money going from the second hand market to recasts, but I can’t know for sure.